Wahlrab explores the understudied question of the function of the global imaginary to facilitate the rise of a global non-violent consciousness. 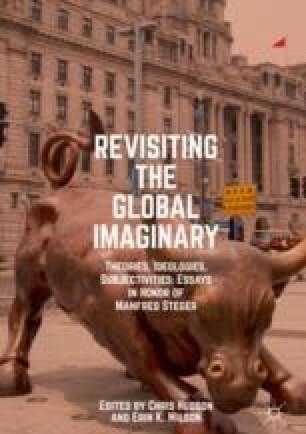 By summarizing the tension in the literature between advocates of the national imaginary and the global imaginary, Wahlrab shows that non-violent social movements imagine themselves to be challenges to national forces and global forces. He also suggests that the national imaginary is not enough to explain the interconnected wave of non-violent protests that erupted in 2010. ‘Imagining Global Non-violent Consciousness’ finds that non-violent political activists from across the globe acknowledge their kindred relationship with each other and endeavor to support the flourishing of local and global social justice. The moment that we find ourselves in is nothing new, as we in Egypt and others have been fighting against systems of repression, disenfranchisement and the unchecked ravages of global capitalism (yes, we said it, capitalism): a system that has made a world that is dangerous and cruel to its inhabitants. Chen, Adrian. 2012. Mark Zuckerberg Takes Credit for Populist Revolutions Now That Facebook’s Gone Public. Gawker, 2 February. http://gawker.com/5881657/facebook-takes-credit-for-populist-revolutions-now-that-its-gone-public. Costa, Rebecca D. 2011. Acclaimed Political Scientist, Francis Fukuyama, Forecasted Arab Uprising During Clinton Years. rebeccacosta.com, 5 May. http://www.rebeccacosta.com/press-room-francis-fukuyama-18.htm. Goldfarb, Michael. 2017. What Is a Nation in the 21st Century? New York Times, 27 October. https://www.nytimes.com/2017/10/27/opinion/catalonia-european-union-independence.html?action=click&pgtype=Homepage&clickSource=story-heading&module=opinion-c-col-left-region&region=opinion-c-col-left-region&WT.nav=opinion-c-col-left-region. Marzouki, Yousri, and Olivier Oullier. 2012. Revolutionizing Revolutions: Virtual Collective Consciousness and the Arab Spring. Huffington Post, 17 July. https://www.huffingtonpost.com/yousri-marzouki/revolutionizing-revolutio_b_1679181.html. Morley, Jefferson. 2005. The Branding of Lebanon’s Revolution. Washington Post, 3 March. http://www.washingtonpost.com/wp-dyn/articles/A1911-2005Mar2.html. Opinion. 2011. To the Occupy movement—The Occupiers of Tahrir Square are with you Comrades from Cairo. Guardian, 25 October. https://www.theguardian.com/commentisfree/2011/oct/25/occupy-movement-tahrir-square-cairo. Smith, Lydia. 2016. Arab Spring 5 Years on: Timeline of the Major Events and Uprisings in the Middle East. International Business Times, 25 January. http://www.ibtimes.co.uk/arab-spring-5-years-timeline-major-events-uprisings-middle-east-1539085. Taub, Amanda. 2016. A Central Conflict of 21st-Century Politics: Who Belongs? New York Times, 8 July. https://www.nytimes.com/2016/07/09/world/europe/a-central-conflict-of-21st-century-politics-who-belongs.html?_r=1. United Nations Office on Genocide Prevention and the Responsibility to Protect. 2017. Responsibility to Protect. United Nations, http://www.un.org/en/genocideprevention/about-responsibility-to-protect.html. Accessed 18 Dec 2017.